I was for sure that the kids were going to sleep late this morning but I was so wrong! Graham ended up coming to our room because he was itchy (his backside and neck have been itchy for days). He was still sleeping soundly when Campbell came and stepped over him to crawl into our bed at 7:03. Aren't these people tired? I am. Couldn't they just sleep in for an hour or two? And really, when I look back over the day, they really should have slept another hour or two. We had meltdown after meltdown all day long-not really from my little 3 but from my big 3. I guess coming back to reality after 4 days at day camp is hard! It was hard on me too! We had our breakfast and picked up the house for a bit. Then it was bathing suits on followed by 10 minutes of picking up sticks. That is when the first catastrophe of the day happened-Reagan was stung by a wasp. I grabbed the ice pack and benedryl (which I have poured more of this week than ever because of Graham's rash) and soon she was no longer screaming. I sprayed the wasp nest and then surveyed the yard to see that we did not make a difference at all during our quick round of stick picking up. Then we loaded up and headed to see Beebee. The kids couldn't keep their hands off of each other but we survived. Anderson almost did not make it though-I asked if he wanted to push Beebee down the hall and he said no. So I told Graham that he could and then Anderson said that he had changed his mind. I told him that maybe he could push Beebee back but Graham was going to do it this time and that is when my normally calm Anderson had himself a fit. I know that I have said it before but it is a wonder that they don't kick us out of Beebee's place. We cause such a commotion and Whitman, even though he brought in his trains, did his fair share of screaming. Next stop was the pool. If my people fought once about Reagan's goggles, they did a zillion times. I was about to lose my mind and jump in the deep end of the pool (I can't swim!) We arrived around noon and had our lunch at 1. Then we swam for another hour before drying off and coming home. For supper, Robby, Keaton and Campbell ran to get supper. And shortly thereafter, our other catastrophe occurred. I am not sure where Anderson was but Whitman and I were laying in the floor in the living room. Reagan was in the room where Graham had been playing basketball on his brand new basketball goal. I had been hearing the thud, thud, kerplunk, thud of him playing ball which shakes the door and pretty much the entire house. But then the thudding stopped and the blood curdling "Momma" scream happened. I sat up just as Graham ran in the room with his head and hand covered in blood. I rushed him off the carpet and grabbed a towel. It didn't take too long to find his cut-it wasn't large but it was deep. Anderson was almost in tears and I briefly thought that Reagan was going to pass out. I had to tell them to move back because they had looks of horror on their faces and Graham was feeding off of them. He stopped crying pretty quick (once we had the bleeding under control) and then I started to have to answer a zillion questions: Anderson asked "what about his party? will we have to cancel?" I answered that of course we wouldn't have to cancel because it was just a little cut (that made me pretty nauseous myself). Graham was concerned about his brain. So I had to reassure him that his brain was fine-or at least as fine as it was before the basketball goal fell on him. Apparently the basketball goal just fell on his head while he was playing. He had played on it for at least an hour while Reagan was watching her movie and he really can't reach it too well but so I don't think that he did anything wrong to cause it to happen (and Reagan was in the same room so she would have definitely told). We were very fortunate because the whole thing seems to be glass-like. It really could have cut him much worse or even his eye so I will gladly take a small and deep cut. Everyone was good help during this: When I mentioned stitches and doctor, Reagan took Whitman and started telling him that they needed to put him some pants on because we were leaving. I assured her that Robby was almost back home and they didn't have to go anywhere. Anderson got the towel and started cleaning up Graham's trail of blood across the house. So as soon as Robby walked in the door, we walked out. On the way to the clinic, I cheerfully told Graham that he was going to get his birthday stitches. He replied that he should have gotten his birthday spankings and not his birthday stitches. Once at the clinic, we were checked in and then we heard someone walk in the door-it was Nonna with a drink for Graham. This brightened his mood and it wasn't too much longer before we were in the room. The doctor numbed Graham's head and we had to wait a bit for that to take. Then Graham said that he could feel something so the doc gave him a few shots in his head. But Graham really didn't react to that medicine so he probably couldn't even feel the shot but that was fine since he was no doubt numb after the medicine and shot. 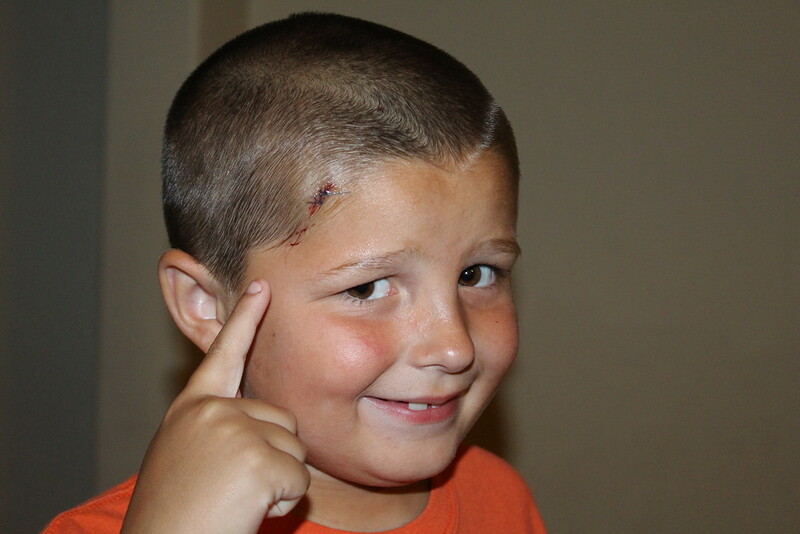 His head only needed 2 stitches and Graham was as still as he could-since we were thumb wrestling through it. The doctor even looked at his rash and prescribed him some meds for that. Graham was pretty happy that he received a teddy bear from the place just like Campbell did when she had been diagnosed with the flu from there. Back at home, everyone had eaten their supper and then watched a bit of tv before going to bed. As soon as we came in, we went upstairs to show everyone Graham's stitches-my Anderson was sound asleep and never stirred. Graham and I ate supper and then it was medicine time and bedtime for him. Quite an eventful evening so hopefully tomorrow we be a little less calm.